Born into a musical family, flutist Elena Rubin began her musical studies on piano at age four. 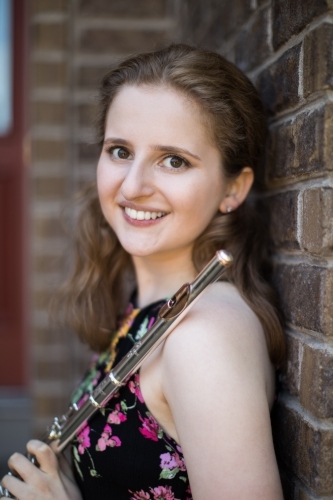 A candidate for a Bachelor of Music at the Eastman School of music, she regularly performs as a principal flutist in the Eastman Philharmonia Orchestra and the Eastman Wind Ensemble. Elena also actively performs new music as a member of Eastmanâ€™s Musica Nova and OSSIA. Recently, she had the opportunity to work and perform with the JACK String Quartet through the OSSIA new music ensemble. In summer 2018, Elena attended Chautauquaâ€™s Music School Festival Orchestra program as a scholarship student. She also spent summers at the the Eastern Music Festival in 2016 and 2017 where she was a concerto competition winner. Previously, she attended the ARIA International Summer Music Academy in 2014 and 2015, performing in masterclasses led by Bonita Boyd, Linda Toote, Christina Jennings, and Jonathan Keeble. Other masterclass engagements include those led by Robert Langevin, Lorna McGhee, Marina Piccinini, Nora Schluman, and Tara Oâ€™Connor. Currently a student of Bonita Boyd, Elena has previously studied with Anne Harrow and Sue Ann Kahn.